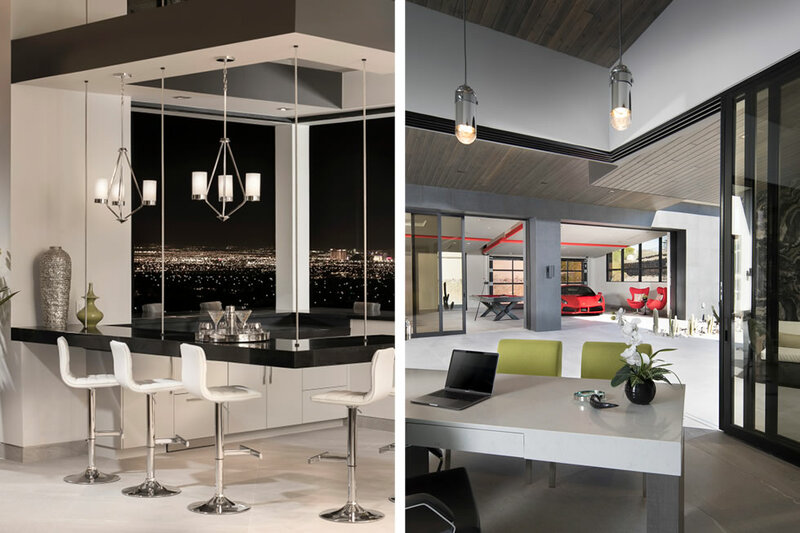 While an 8,200-square-foot modern home set on a hillside overlooking the desert and the Las Vegas Strip may not be within the budget for most homebuyers, The New American Home is meant to be a prototype for future home design. 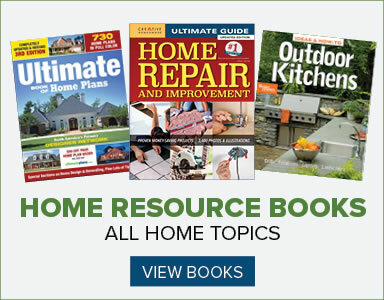 For the past 36 years, the National Association of Home Builders and other sponsors have supported the building of a show house near the International Builders Show to demonstrate products, building techniques and design trends. The 2019 New American Home, built in the private gated community of Ascaya in Henderson, Nevada, was built by Sun West Custom Homes. 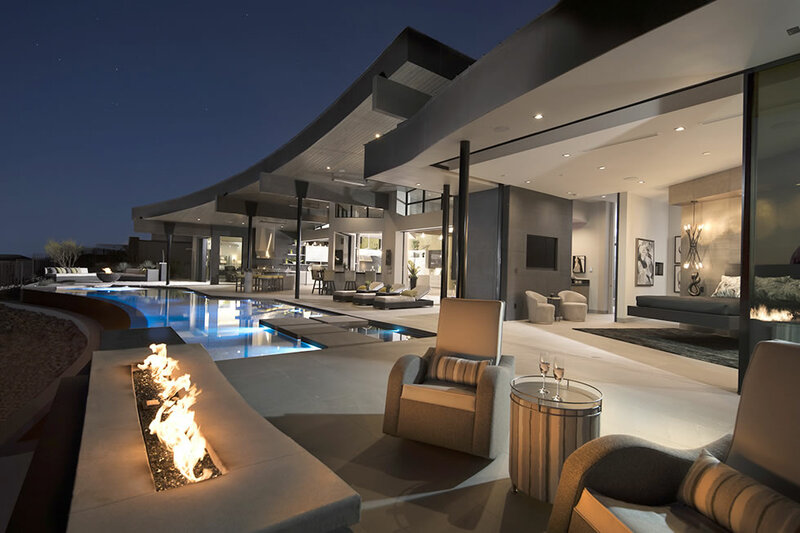 The glamourous home features an infinity-edge pool with a fire pit so homeowners can float while the fire flickers and the lights of the Strip blink in the distance. A glass-enclosed garage serves to show off the owners’ Lamborghini or Ferrari as well as function as an air-conditioned bar and game room. But those features are just the bling. Underneath the glitter, this house offers a glimpse of design techniques that could be coming soon to homes across the country. Open floor plan taken to an extreme level. While the bedrooms and bathrooms have solid doors, the rest of the house is either completely open or separated only by retractable glass doors that can open to the outside. Only the roof overhead indicates if you’re indoors or outside since the flooring often extends from the inside of the house to the outside. A gas fireplace in the living area is partially inside and partially outside. When the glass wall is open, the fireplace extends for 16 feet. The main entertaining area includes a living area, a dining area, a bar, two center islands and the kitchen, all completely open. A glass wall can be opened to convert the main kitchen and the adjacent outdoor kitchen into one open kitchen. Energy-efficiency, even in a glass-enclosed house. Desert weather conditions, a large size and a house built with numerous floor-to-ceiling windows and walls of glass make energy-efficiency more challenging than it is for building a smaller home in a moderate climate. Sun West worked with Two Trails, a Florida-based green building consultant, to design a highly energy-efficient house that reaches Emerald level, the highest efficiency level of the National Green Build standard. While energy-efficient windows, systems and appliances help, a big part of the reduction in energy use comes from the super-insulation of the house under the slab foundation, behind walls and in the ceilings. Adding fire while maintaining safety. The New American Home has an abundance of flames from gas fireplaces in the living room and master bedroom as well as fire pits outside. The indoor fireplaces are all gas fireplaces enclosed behind glass that provide psychological warmth but no heat. In many jurisdictions across the country, wood-burning fireplaces have been banned because of environmental concerns. Outdoor fire pits on the pool deck and on several outdoor patios are visible from several rooms in the house. While the nearly $6.5 million price tag isn’t something buyers are likely to see every day, some of its features may become more common in newly built homes around the country.